Americans say they're more comfortable with a woman in a boardroom than in the White House, according to a recent survey by Kantar, a data and consultancy company. The findings were published on Tuesday at the Women Political Leaders Global Forum in Reykjavik, Iceland. In the survey, 63 percent of American respondents said they'd be "very comfortable" with a female chief executive officer, while only 52 percent said they'd feel the same way about a woman as the head of government. Men and women felt differently on the issue: 70 percent of women said they'd be "very comfortable" with a female CEO — 55 percent of men felt the same. Just 45 percent of men said they were "very comfortable" with a female head of government. "America hasn't yet created norms regarding very senior women in politics," said Michelle Harrison, the global chief executive officer of Kantar, in a telephone interview with CBS News. Kantar conducted the survey in September and October of this year, interviewing 1,000 people between the ages of 18 and 64 in each of the G7 countries, which includes the Canada, France, Germany, Italy, Japan, United Kingdom and United States. 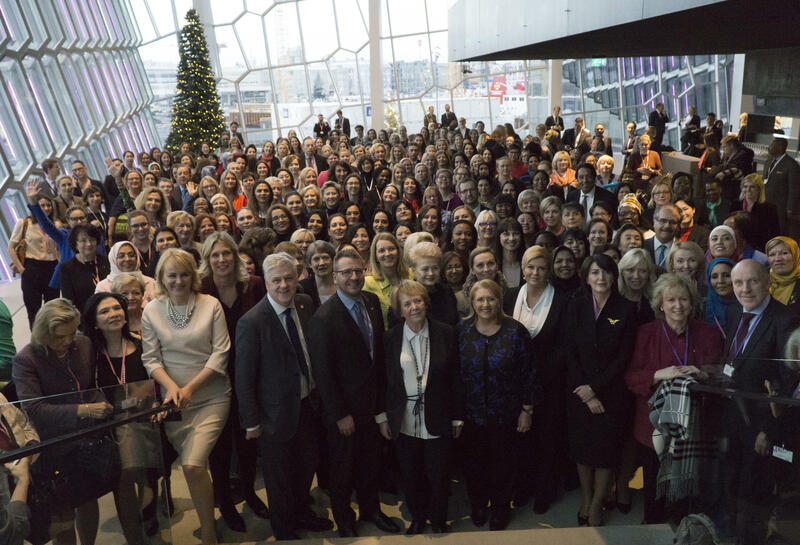 The survey was designed to create the first Reykjavik Index for Leadership, a 1 through 100 scoring system on how people view women's "suitability" for public and private leadership throughout the G7. A 100 point score would indicate that the entire population views men and women as equally suitable for all leadership roles. The overall index score was 66 for 2018. Across the seven countries, the index was higher for female respondents than male, meaning that women were more likely than men to view the sexes as equally suitable for leadership positions. The views of men and women were the most similar in the United Kingdom and differed the most in Germany. Less than a quarter of German men said that they would feel very comfortable with a female head of government, despite Angela Merkel's position of Chancellor of the country, the highest political position in Germany, since 2005. Silvana Koch-Mehrin, the President and Founder of the Women Political Leaders Global Forum and German herself, didn't find the result surprising. "German leadership, it's changed, but it's still vastly male," Koch-Mehrin said in an interview with CBS News. "There hasn't been a big societal change that questions who should be doing what." Across the G7, many science and engineering fields received a 75 index score, indicating that three quarters of survey respondents felt men and women were equally suited to lead these sectors. Survey respondents believed men and women were the most equally suitable for leadership roles in the media and entertainment industry, which received an index score of 80, a finding that Harrison believed to be inspiring. "If we're on a journey of 100 miles, it's as if we've already driven 80 of them," she said.